You’ve been together for the worst of times and the best of times and decided that you want to retie the knot! Some may call it excessive, but we think your love is magical and deserves a standing ovation. The wild, wild west is a great wedding theme, as it is both vintage and entertaining! You can have a mock show down, a western square dance, and some good old-fashioned fun. Any venue can be transformed to feel and look like the old west, especially an outdoor venue like a garden or farm which, would allow you to capture the essence of the old west perfectly. You could also try and rent out a saloon, or western themed restaurant, as they will already have many of the props for you. When it comes to your decorations, the west was all about the brown and ivory color scheme. Feature brown and vintage ivory tablecloths and don’t be afraid to incorporate a third color that you like such as yellow or pink! Your centerpieces should include wild flowers such as sunflowers, carnations, or daisies. The best part about this theme is that you could really make it an unexpected and fun affair for your guests. As for your ensemble, decorate your dress with a pair of Ariat cowboy boots and pearls, like this bracelet from http://www.snqueens.com. What a better way to celebrate your undying love for each other then in the most romantic city in the world! If you can’t go to Paris, bring Paris to you with this vintage theme! With an amorous color scheme of red, white, and gold, this theme is sure to provide an enchanted night. Set the mood with soft lighting such as candles or tea lights. Garnish your tables with lace, rose petals, and maybe even an eiffel tower for a true Parisian effect. Hire an accordionist to entertain your guests with classical music straight from France. One of the many things that the French are famous for is there fine dining expertise, make sure to incorporate French foods into your menu such as croissants or creme brulee. A Paris theme is one filled with luxury, so be sure to dress the part by incorporating fur, lace, and diamonds into your outfit. For a simple, yet elegant look, try a pair of eye-catching studs like these diamond earrings from www.diamondstuds.com. This era was filled with all things beauty. For a Victorian themed wedding, capture the beauty by incorporating pastel shades of pink, soft browns, and ivory. Decorate your tables with rose petals and pearls to capture the royal aspect of this time. You can add a unique touch by incorporating a garden theme to your place card holders, such as using birds, or even miniature tree branches. As an added bonus, include party favors for your guests as the royals of this time loved to give their guests small gifts. Incorporate the Victorian era into your dress by adorning yourself with a vintage lace veil, high neckline, and a Victorian styled necklace such as this stunning necklace found on http://www.barkevs.com. Better known as the Roaring 20s, this decade was known for its over the top parties. 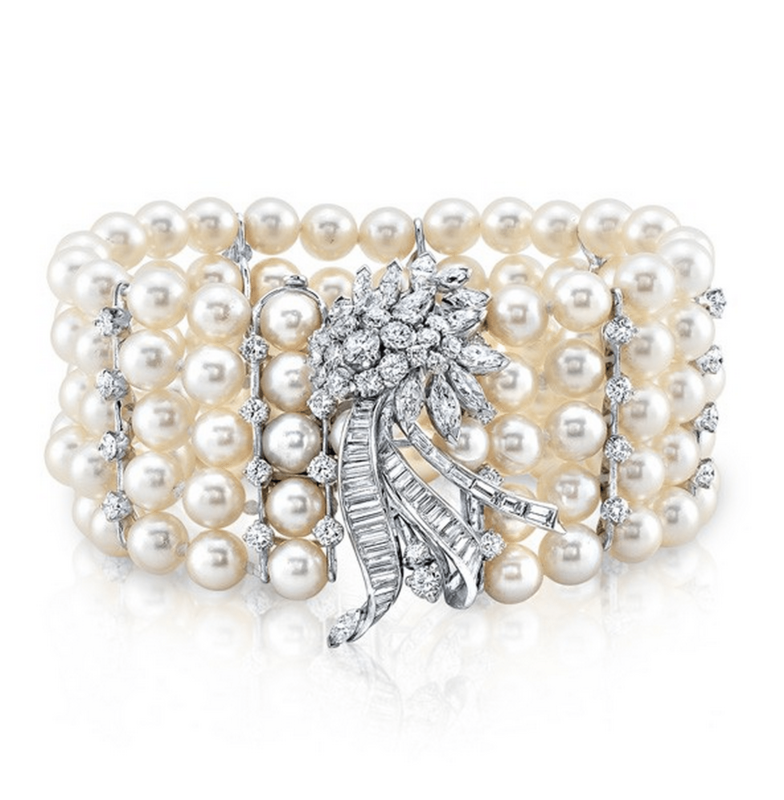 Get inspired by the vibrancy of the era and fall in love again with pearls, cocktails, and flappers. The colors that go best with a 1920s theme include ivory, pink, coral, and green. You can incorporate these colors in your centerpieces by opting for ivory and pink colored roses. Or, you can take your own spin on it as long as you keep the vintage effect in mind! The 1920s popularized a dropped down neckline to allow your jewelry to fall gracefully with the neckline of a flapper dress. Capture the roaring 20s in your look by incorporating a statement necklace, like this art deco style necklace at http://www.1800loosediamonds.com. Nothing is more vintage than black and white and the 1940s were all about this classic color scheme. You can incorporate the black and white theme into every aspect of your wedding including the bouquets, centerpieces, and dress code. The 1940s were known for their musical contributions. You could hire a live band to play at your wedding that incorporates famous artists from the 40s like Frank Sinatra to serenade you on your special night. You can incorporate the musical aspect into your centerpieces. Sheet music that lays under the centerpieces are a great musical element that works best for the era. Incorporate the 1940s theme into your outfit by featuring vintage style jewelry that incorporates the black and white color scheme, such as this statement necklace by http://www.nataliek.com. The glitz and glam of old-school Hollywood is a formal way to celebrate your never-ending love. Your color scheme should be red, black and gold—a perfect idea for the couple renewing their vows on their golden anniversary. Really bring Hollywood to life with a nighttime celebration featuring a red carpet, cocktails, and fanciful gowns. Ask friends or family to play paparazzi or dress up as famous Hollywood celebrities like Marilyn Monroe. You can even incorporate the cinematic aspects of Hollywood by playing your personal favorite home movies, or even a black and white film of your first wedding. Don’t forget to dress the part! Hollywood is still very much about being fashionable. You can accessorize just about any dress with some Hollywood glitz by adding a birdcage veil, gloves, and some diamonds. Try these stunning earrings from http://www.bridalrings.com.